As a NOAA Weather-Ready Nation Ambassador, iWeatherNet strives to create educational content to help you be prepared for any type of severe weather; this includes winter weather. I wanted to take the opportunity to briefly review the various winter weather products issued by the Atlanta National Weather Service in Peachtree City. In other words, both an “advisory” and a “warning” are upgrades to a watch. An advisory is “worse” than a watch and a warning is “worse” than an advisory. 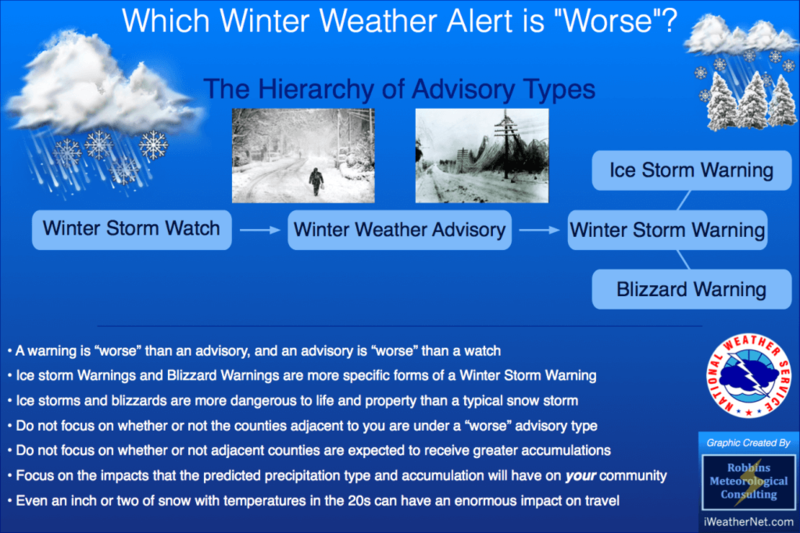 Ultimately, the difference between an advisory and a warning lies in the predicted accumulation and expected impacts. Sometimes, the impacts of a small and seemingly insignificant accumulation can be nearly the same as those of a large accumulation. What Constitutes a Winter Storm or an Ice Storm in Atlanta? A Winter Storm Watch is issued when significant winter weather (i.e. 2 inches or more of snow, ½ inch or more of sleet, ¼ inch or more of freezing rain, or a combination of these events) is possible, but not imminent. A watch is typically issued 12 to 48 hours before the possibility of winter weather. This is the time to prepare. 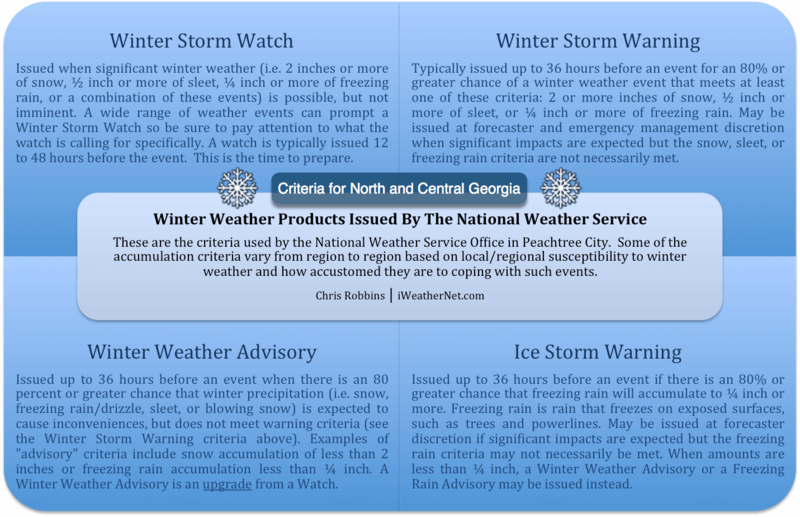 A wide range of weather events can prompt a Winter Storm Watch so make sure to pay attention to the specific forecast for your community and the possible impacts. A Winter Weather Advisory indicates that winter weather is imminent and may cause inconveniences. An advisory is an upgrade to a watch; however, in some situations, an advisory may need to be issued even if a watch was not previously in effect. When an advisory is issued, monitor the media or other trusted/credible sources for your local impacts. A Winter Weather Advisory is issued up to 36 hours before an event where an 80 percent or greater chance of winter precipitation (i.e. snow, freezing rain/drizzle, sleet or blowing snow) is expected to cause inconveniences, but the predicted accumulations do not meet the warning criteria (see the warning criteria below). At forecaster discretion, a Freezing Rain Advisory may be issued in lieu of a Winter Weather Advisory when freezing rain is expected to be the predominant precipitation type, and small amounts (a thin glaze less than ¼ inch) are expected. When an advisory of any type is issued, this is the time to put your winter weather safety plan into action. A Winter Storm Warning is issued when a significant winter storm (i.e., two inches or more of snow, ½ inch or more of sleet, ¼ inch or more of freezing rain, or a combination of these events) is imminent and is a dangerous threat to life and property. A Winter Storm Warning can also be issued at forecaster discretion when significant impacts are expected but snow, sleet, or freezing rain criteria are not met. Winter Storm Warnings are typically issued up to 36 hours before an event that has an 80 percent or greater chance of significant winter precipitation. This is the time to put your winter weather safety plan into action. An Ice Storm Warning is issued up to 36 hours before an event if there is an 80% or greater chance of ¼ inch or more of freezing rain. As mentioned above, a Freezing Rain Advisory may be issued for amounts less than ¼ inch; however, if significant impacts are expected, even with amounts less than the warning criteria of ¼ inch, an Ice Storm Warning may be issued at forecaster discretion. Again, focus on the predicted impacts and not the amounts. ✏️ Remember: A warning is “worse” than an advisory, and an advisory is “worse” than a watch. Focus on the impacts that the predicted precipitation type and accumulation will have on your community. Do not focus on whether or not the adjacent counties are under a “worse” advisory type or if those counties are expected to receive greater accumulations. As we learned in January 2014 and other past events, even an inch or two of snow with temperatures in the 20s can have an enormous impact. Tagged NOAA/NWS, Weather-Ready Nation, winter storms, Winter Weather Topics.